Thank you, thank you to Phil at Brandywine Books for pointing me to this delightful article,Wodehouse Saved My Life by actor Hugh Laurie. Laurie is as funny on paper as he is on the stage or screen. I was, in truth, a horrible child. Not much given to things of a bookery nature, I spent a large part of my youth smoking Number Six and cheating in French vocabulary tests. I wore platform boots with a brass skull and crossbones over the ankle, my hair was disgraceful, and I somehow contrived to pull off the gruesome trick of being both fat and thin at the same time. If you had passed me in the street during those pimply years, I am confident that you would, at the very least, have quickened your pace. You think I exaggerate? I do not. Glancing over my school reports from the year 1972, I observe that the words "ghastly" and "desperate" feature strongly, while "no", "not", "never" and "again" also crop up more often than one would expect in a random sample. My history teacher's report actually took the form of a postcard from Vancouver. I keep meaning to dial up Laurie's new TV series, House but the only shows I can seem to remember to watch on a regular basis these days are 24 and Battlestar Galactica. 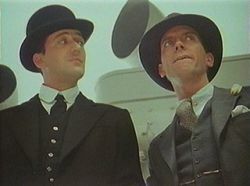 Whether he is in Black Adder, Jeeves and Wooster, or Stuart Little, Hugh Laurie is always interesting to watch. I am now headed to the bookcase to find my Wodehouse and read "Uncle Fred Flits By." You might enjoy Hugh Laurie's only book _The Gun Seller_. "In 1996 Hugh published his first novel, a comic thriller called The Gun Seller, described as follows in publicity material: 'When Hugh Laurie was a teenager, he adored reading thrillers by authors like Alistair MacLean. The Gun Seller is his tribute to those books, an hilarious spoof [of the genre] that also wickedly updates it for the Nineties'; '...a fast and thrilling tale of Thomas Lang. 36. Penniless and achingly single. A man with nothing to lose but his heart and his Kawasaki ZZR1100.' The book was very well-received by the British press, and became a best-seller in both hardcover and paperback. Here is a selection of reviews:"
Thank you so much for this tip! I am looking for this today!! !